No matter how many times you have done it or how organised you are, airports and travelling days are stressful! With airlines charging us per kg if our suitcases are too heavy, we need to consider things when packing. 1. Check the luggage allowance for your flight. I understand Thomson give the least hand luggage allowance, just 5kg. Many small hand luggage cases weigh almost 3kg. Most airlines allow 20kg for the main suitcase, but how many villas have scales to weigh the case on your return. With this in mind, I am going to TRY to keep to 15kg for my next holiday, so that coming home is more relaxing! 2. Weigh your packed suitcase on bathroom scales before you leave home and leave some kg’s for the return, presents etc. 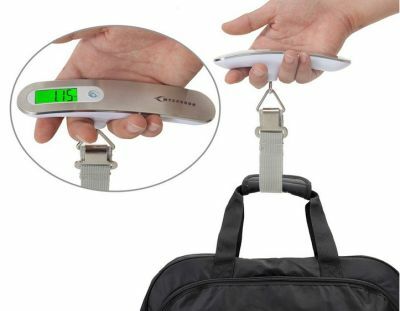 If like me you always pack far too much, they now sell portable suitcase weigher‘s RRP £7.59. I often find travelling quite stressful, so if I can eliminate the dreaded thoughts of whether my case is too heavy, it’s one less thing to cause me to worry! Remember to pack to luggage weigher so that you can weigh your suitcase on your return as well! 3. Save beauty sachets from magazines and take these instead of bottles. Take almost finished toothpaste. Bottles weigh a LOT, and you never use as much as you think that you will! 4. Wear your heaviest clothes and pack socks, books etc. in the pocket of the jacket that you will wear onto the aeroplane. Not only will this save the weight in your case, but it will keep you warm! There is nothing worse than being cold on a flight! 5. If you forget anything (I once left all my freshly laundered cotton blouses at home), Paphos has many Charity Shops where you can pick up items at a low price. They are also great for toys too, and you can leave them in the villa for the next children. Check out our Before you go info here!